Category: Did God Use Evolution As His Method For Creation? Under the banner of “theistic evolution,” a growing number of Christians maintain that God used evolution as his method for creation. This, in my estimation, is the worst of all possibilities. It is one thing to believe in evolution; it is quite another to blame God for it. First, the biblical account of creation specifically states that God created living creatures according to their own “kinds” (Genesis 1:24–25). As confirmed by science, the DNA for a fetus is not the DNA for a frog, and the DNA for a frog is not the DNA for a fish. Rather, the DNA of a fetus, frog, or fish is uniquely programmed for reproduction after its own kind. 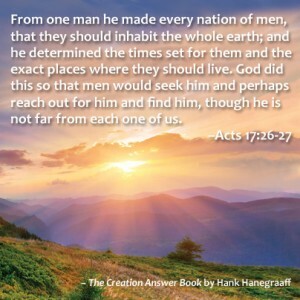 Thus, while Scripture and science allow for microevolution* (transitions – adaptation – within “the kinds”), they do not allow for macroevolution* (amoebas evolving into apes or apes evolving into astronauts). Finally, theistic evolution is a contradiction in terms- like flaming snowflakes. God can no more direct an undirected process than he can create a square circle. Yet this is precisely what theistic evolution presupposes. Evolutionism is fighting for its very life. Rather than prop it up with theories such as theistic evolution, thinking people everywhere must be on the vanguard of demonstrating its demise.